The first reported POMS mortality outbreak was in France in 2008. POMS affects Pacific Oysters - it cannot be transmitted to humans and there are no human health implications. POMS has not affected the Sydney Rock Oyster or the Native (Angasi) Flat Oyster. POMS was first detected in NSW in November 2010 when oyster farmers in the Georges River reported mortality of wild and farmed Pacific Oysters. Immediate reporting of these mortalities resulted in rapid action by NSW DPI to investigate the cause and implement controls on movement of oysters and equipment from the area to help prevent further spread of the disease. 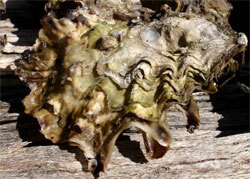 In January 2011 the disease was also found in wild Pacific Oysters in Parramatta River. In 2011 national surveillance for POMS was conducted in NSW, South Australia and Tasmania. The results found POMS only in two NSW estuaries at that time (Georges River and Parramatta River). In late January 2013, high mortality was observed among farmed triploid Pacific Oysters from the Hawkesbury River and POMS was detected. 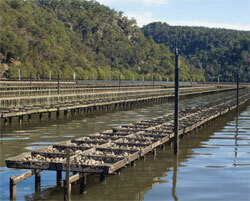 In February 2013 the virus that causes POMS was detected in wild Pacific Oysters from Brisbane Water. POMS is a disease that only affects Pacific Oysters (Crassostrea gigas) and is caused by a virus called OsHV-1 micro variant. This virus has not affected other oyster species, such as the Sydney Rock Oyster. How does POMS affect oysters? Oyster mortality resulting from this disease can be very rapid (e.g. up to 100% mortality within days of initial detection). Mortalities are most prevalent between the months of November-April in the Georges River estuary, however little is known about the disease in other affected estuaries. Studies in Europe found that POMS was detectable in oysters after mortalities ceased, which indicates that surviving oysters can act as carriers of the virus. At this stage, little is known about the lifecycle of this virus. The highest mortalities occur in juvenile oysters (between 60%-100%), however all life stages have been recorded as susceptible. Outbreaks of POMS are believed to be temperature dependent, with the likelihood of POMS increasing as water temperatures rise. A number of studies in Europe suggest that outbreaks of this disease do not occur when the water temperature is below 16 ºC. The available data from NSW, although limited, suggests the temperature at which expression of disease is likely to occur in NSW is approximately 22 ºC. In which localities does POMS occur? Since the acute outbreak in France in 2008, OsHV-1 has been detected in Pacific Oysters in the UK, Ireland, the Netherlands, Spain, Italy, Asia and New Zealand. POMs has been detected in NSW in the Georges River/Botany Bay, Parramatta River/Sydney Harbour and Hawkesbury River (including Patonga Creek). DPI surveillance also found the virus that causes POMS in wild Pacific Oysters in Brisbane Water in February 2013. For more information on the Tasmanian outbreak, see the Tasmanian Department of Primary Industries, Parks, Water and Environment. It is not known how POMS arrived in NSW. Researchers are continuing to monitor Georges River to elaborate key factors affecting disease expression, such as oyster size and age, and water temperature. ‘Oyster Health Sydney’ is a project from the Aquatic Animal Health team in the Faculty of Veterinary Science at the University of Sydney which in July 2012 began a new research project in relation to POMS virus in NSW, for more information on this work, visit University of Sydney’s POMS disease research. NSW DPI is working closely with the Tasmanian government. Restrictions are currently in place that limit the risk of spread of POMS from infected Tasmanian areas into NSW. Movement controls and strict biosecurity conditions have been put in place to prevent movements of oysters and oyster farming equipment from the Georges and Hawkesbury Rivers, and Brisbane Water to any other NSW waterway. Strict biosecurity protocols are also in place for researchers and their equipment entering and leaving affected locations. A policy has also been developed that outlines management actions and legislative provisions that may be used in response to suspected or confirmed further outbreaks of POMS in NSW waterways. NSW DPI encourages all community members to report all suspected aquatic disease events so they can be investigated. In particular Fish Care Volunteers, recreational fishers and community groups can assist by reporting mortality outbreaks in wild Pacific oyster populations. Improved vigilance in recreational boat cleaning helps reduce the spread of aquatic diseases and pests. Make 'clean' part of your routine - learn how via this aquatic hygiene factsheet. Keep updated via the NSW DPI management of POMS page. Report it! Suspected disease events should be reported to Aquatic Biosecurity on (02) 4982 1232.